I was wondering, which is better, the Safc or the Vafc and to the guy that made this thread where are you located? send me a pm! Depends... VAFCII has more tuning points, but SAFCII makes BBMAF's PnP. Looking forward for a prompt reply. So my easy question last night got lost in the great flame war, but I'm just kind of curious as to the header situation. I've been wondering this. When I put Cattman headers on a bone stock DE-K. I've been led to believe it's going to run rich. Can I use something as simple as the HKS MAF AFR unit http://www.hks-power.co.jp/usa/products/Pid=632.html & tune to correct for the headers. Or is it necessary to get into something more complicated/expensive. Get a wideband and AFC, that's the cheapest, most versatile (for the price) and easiest way to go. So the 6th gens don't need a special O2 sensor because their O2s are already wideband, correct? I'm looking into replacing my ailing, vibrating precats with Cattman headers on an otherwise stock car. Since my car is new enough to rock out UpRev's stuff, I can just swing by the local tuning shop (http://www.dynosty.com/blog/) and pay them to fix the ignition timing to something geared for premium fuel, raise the rev limiter a bit, and get fixed fuel maps, all in one go? Or do I still need other equipment to feed the ECU or tuners with enough information to accomplish all this? My goal is simply to kill the precats, not create a 6th gen that thinks it's as fast as a 5.5 gen. I want something subtle so I can eventually sell the car and get something RWD pull a Rochester. Last edited by Eirik; 04-07-2012 at 01:18 PM. Theoretically, no. With the 6th gens, you can get a software program like UpRev/OSIRUS and monitor them, and tune also. No, you can only bump base timing 2º. You cannot tune the AFR or dynamic timing or change the rev limiter with the Uprev. It's more of a glorified monitoring software than tuning software. OSIRUS can, but our ECU's aren't new enough. So, are you asking about a 6th gen or 5.5 gen? 6th gen. I REALLY should update my signature picture to end this confusion, eh? Also, UpRev is the company. Cipher is their logging software and Osiris is their ECU-flashing software. 1. They can tune 04-08 (possibly higher?) Maximas, but they might have to send off to UpRev to get back custom code to interface with the ECU. When I inquired a week ago, they (Dynosty) only had an '05 5-speed auto in their system. They were confident they can flash any of them, given a bit more time than the one ECU variant they have on file. 2. It costs $600 to do this. $300 for the Osiris license and $300 for the dyno tuning time. 3. You can tune a 6th gen for headers without any installing any AFCs. =D The wideband O2 sensors in the 6th gen (Nissan calls them "Air/Fuel Sensors" to distinguish from the "Heated Oxygen Sensors") have an output range of nearly 0 to nearly 3 volts, with 1.5 being stoichiometric. But I was confused. I was under the false impression that even aftermarket pre-cats for VQ35s cost $500, a paltry savings on the $700 OEM variant. WRONG! RockAuto is selling Wagners for $220 each, with a $50 rebate to boo! So I bought two new aftermarket precats, with shipping, for exactly half(!!) the price of one Nissan precat. When I get them swapped on, I'll do a "Look at these images and tremble" thread and shoot more holes in the "my precats went up my exhaust stream and exploded my engine " theory. PS: I keep posting in this forum because, NMex my friend, the 6th gen guys are straight up embarrassing! Even the guys with the fastest fat-body Maximas on the planet know less about how it all works than a certain member on here that hearts his crazy loop exhaust complete with "merril" bends. There is not a single Sparksmax, not a single NMex, nor any Nelledges, not even a Scottwax and certainly not a Rochester! It's embarassing. Case in point. Last edited by Eirik; 04-15-2012 at 08:07 AM. Looks as if you’ve done enough research to answer your on questions. I’ve read on the Z/G sites that some of them still get an aftermarket WB since it has a bit more resolution (0-5v, vs 0-3v) IMO, I think it’s fine (OEM 3V), but as far as the 5 and 5.5gen are concerned (general information and to not confuse anyone), that narrowband 0-1v just is pathetic for accurate AFR control. Looks like you’re well on your way to make a cool 6th gen. I agree, but thought it would be nice to keep it in here as a starter thread for those that are interested, but have yet to take the next step. I might add it to a relevant sticky in the AM section come to think about it. Also, some things are universal, but I like how Ceffy tailored it to the 5th gen crowd. I have some old MAF logs, let me take a quick look. With all that said , mine fluctuates between 0.27 and 0.40 volts under heavy load/RPM (5K+). So, not much. I haven't done any recent testing with the complete 3.5" intake. So, i will do that and let you know, but for the most part, my AFR;s have been quite smooth. Seen both with my dnyos and WB. Last edited by NmexMAX; 05-17-2012 at 02:39 PM. does anyone have a re-flash image, or copy of the nissan ecu maps for a 5th gen Vq30? I'm interested in getting my 5.5 tuned is it necessary to have some kind of piggy back system to do so or can it be done with just a laptop while on the dyno...????? Read the thread, you can't just plug a laptop in and tune using MS Word. i have a stock 02 SE other than a stillen hi flow intake. more stuff on that way. should i look into getting one of these sooner rather than later? ie. before headers and exhaust? Is there anybody who just tunes these 3.0 motors instead of buying anything of my own? Its relatively simple if you know whats going on behind the scenes. I wouldn't bother with it until you have most bolt ons. On our cars the fuel/ignition maps are designed rather conservatively to balance performance, fuel mileage as well as knock suppression for those who use less than 92/91 octane fuel. So the timing curve isn’t aggressive and fuel maps are on the rich side. For Maximas with breathing mods (headers/exhaust mainly), the car’s factory ECU can readjust itself to optimize the Air/Fuel ratio (AFR) inside the engine at part throttle/cruise because it gets feedback from both the MAF sensor and O2 sensor. However, at WOT, the factory ECU goes into “open-loop” mode, where the fuel/timing is determined by a table using Airflow voltage (engine load) vs. RPM. 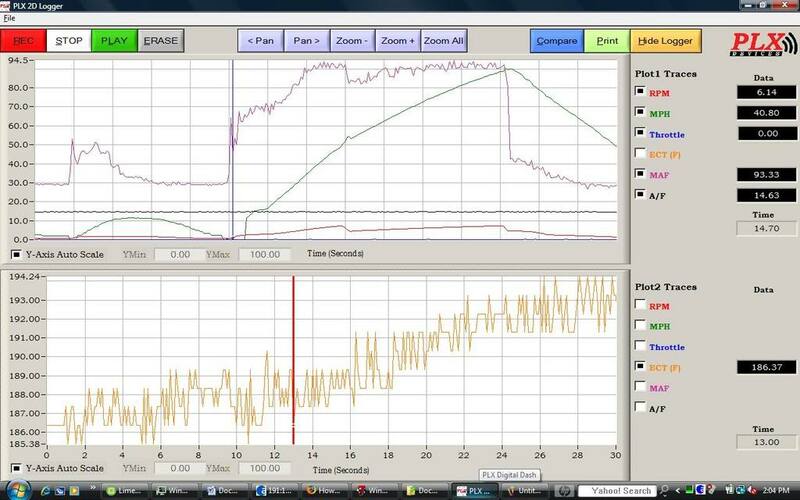 Since the ECU is ignoring readings from the car’s O2 sensors, the AFR is not adjusted, and therefore not optimized. No, you can't just "tune" using a laptop and a laptop only. Is it possible that the obdII Bluetooth / phone app tuners will replace the simpler piggy backs or is the obd port limited to ignition advance only? I know it can't replace haltec, utec etc that's not what I'm talking about. I mean the controlers like AEM FIC and apexi. Would changes made through obd be persistent? Not likely. The AFC's intercept the ECU signal and modify it but do so with only a few parameters which in turn affect other parameters (i.e. 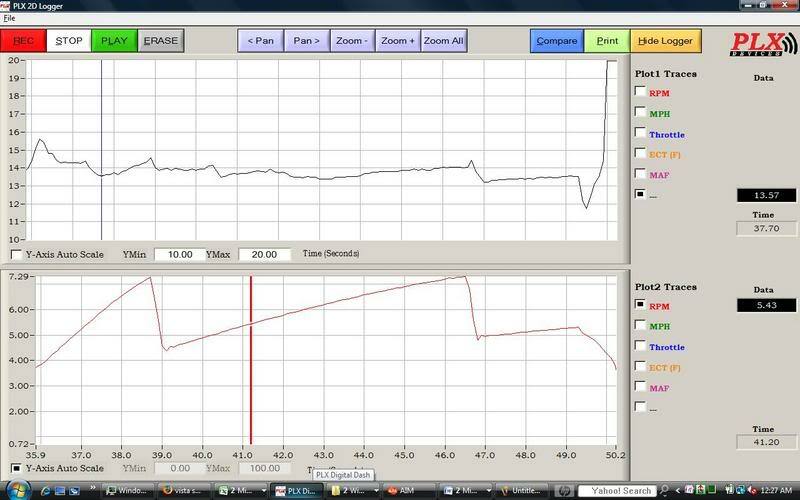 MAF v, IPW and timing relation) which sometimes can cause undesirable affects if not done "correctly". Whereas the other units you mention actually take control of FAR more inputs/outputs, so in short no. 2.) Phone apps/OBDII/Consult interface isn't advanced enough like the 6th gen in order to support an UpRev type of tuner. Is there any kind of auto tuning that can be made on these cars? For example with spacers , intake, exhaust, block off plate , ypipe. I dont need anything but a small tune for everyday street use. Will a performance shop have what is needed to do this? A performance shop will only have a chassis dyno to perform the tuning with the equipment you give them. By auto tune ... just something I can plug in and choose a simple street tune instead of playing with settings wich is way to advanced. From what monce said that's to much for me to spend. Im looking to spend 300 for everything completely done with no chance of issues. I just figured a shop would have everything needed. I don't take my car to the track, I just want the power for going around cars or if someone acts up. Sometimes the lil kids in civics like to get burned. Whats up with a chip? No good for the max? Last edited by maximasicilian123; 04-21-2014 at 11:03 PM. That's how some of things work, like the EMU. Dial in an AFR, and it will do it's best to maintain it, with respect to throttle position and RPM, as well as timing, though timing is slightly dynamic and cahnges with RPM, throttle position, etc. 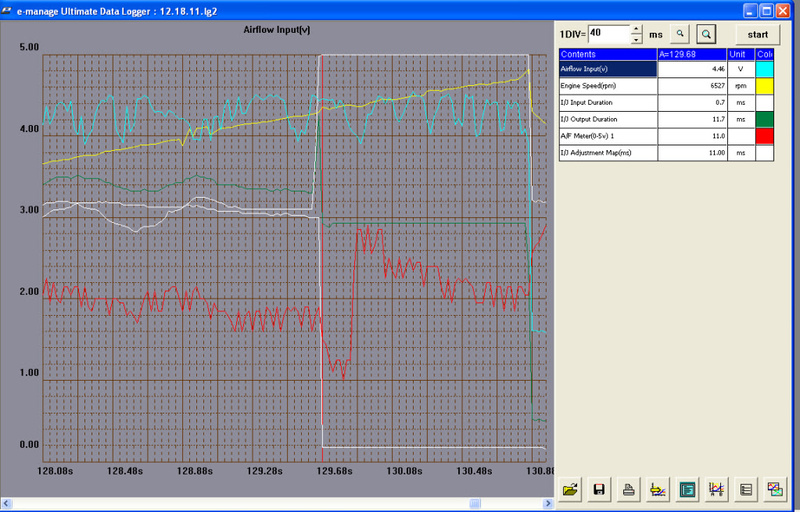 Same goes for AFR, but AFR is a little simpler in that 100% throttle is usually the best way to dial it in. The SAFC does the same, only thing is that you need to actually dial it in initially which takes a few street runs or some dyno time. If that's the case, then "tuning" is not for you. No "chips" for these cars. sorry for reviving an old thread but i noticed that there wasnt too much talk of uti software. its nice because you can datalog the utec and wideband together at the same time. ive been having a hard time installing my utec into my 350z. Ive been asking around all the z forums and decided to try this knowing that guys install utec on the max.